Krittika, the 3rd Nakshatra is represented by the goat and is the first of the Nakshatra to span 2 zodiac houses, Aries and Taurus. 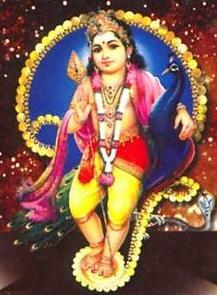 Krittika is the first of the constellations to span the cusp of 2 zodiac houses in Vedic astrology. 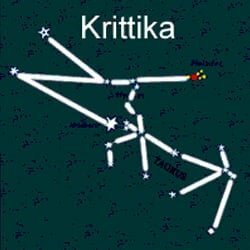 Krittika birth star is ruled by Agni, or the Lord of Fire and is represented in the Pleiades, or 6 sisters’ constellation. The sisters were the children daughters of Atlas and Pleione who were turned to doves and placed in the cosmos by Zeus. It is told the Karttikeya, the warrior, was born in the Pleiades and was cared for by the 6 sisters thus the Nakshatra bears his name. Pompous, motivated and determined, they are fervent advocates recognized for their tendency toward adoption and providing care for other people’s children. People born to this Nakshatra according to Jyotish are known for their cutting wit, may be prone to sarcasm, and perhaps overly-critical. ntrolling their anger. This is attributed to the Nakshatra being ruled by Agni, the Lord of Fire and the Nakshatra’s dominion over war and conflict. Prone to inconsistency, their lives have regular ups and downs and their career activities are many and varied due to indeterminate choices. The flawed decision-making process may promote participation in illicit activities and sexual affairs. Krittika can also present a harsh front to the world and be viewed as callous. This may impede their ability to find and hold onto love. The natives of Krittika are generally of average height, have soft eyes, thick necks and prominent noses. Their strong demeanor and calm appearance project a peaceful disposition and they are well respected among family, friend and by their peers. Bestowed with intelligence, a sense of adventure and free-thinking personas, Krittika have a love of life that keeps them on the move. They tend to live in many places, experience a variety of professions and are curious about other cultures. The natives of this Nakshatra are wise souls, make good friends and are loyal advisers to others. Humanitarian in their approach to relationships, they promote well-being for all. Oriented to the ‘big picture’ they may become frustrated and lose interest in their activities as successes are often intangible. The challenges they face can be minimized with attention paid to balancing their minds and to staying firmly grounded in reality. These free-thinking adventure seekers do not manage restrictions well, their work-life may involve extensive travel and they prefer to work in unstructured environments where self-direction is essential. While life may present the Krittika with many challenges, their family brings them much joy and inner peace. They enjoy close relationships with their mothers and are often blessed with blissful married lives. They are known to be loyal, devoted parents and excellent spouses. Lovers of food, Krittika’s tend to neglect their diet and are prone to overindulgence. This may create health issues; such as dental issues, pulmonary distress, fever, meningitis and poor eyesight. Previous What Is Your Greek Zodiac Sign?